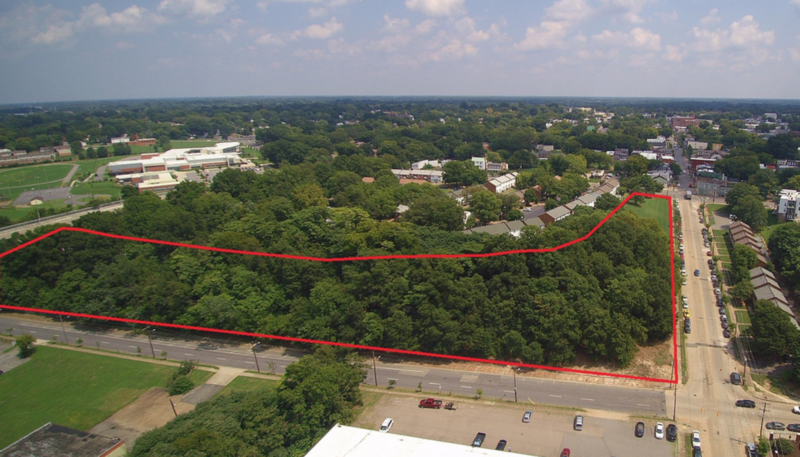 One of the last large tracts available for development in the City, this property is ideally situated between thriving Union Hill and bustling Shockoe Bottom. This 3.627 acres boasts stellar views of the downtown skyline and would make a perfect site for high-end rowhouses or a large scale mixed-use development or both! The downhill portion of the site is zoned B-5 and allows for townhouses, multifamily, office, commercial, etc. Preliminary architectural studies show that the site can easily accommodate 200+ units that would have premier views and access to downtown and VCU Medical Center. The uphill portion of the site is zoned R-53 and allows for townhouses and duplexes. Watching this like a freaking hawk. Urban Gods, I have not asked you for much, please bring upon us something of quality. Please not more low-quality condos. Help us continue the work we’re doing to strengthen our neighborhood. We’re doing great work as a community! Keep us safe. Keep our neighborhood interesting. This is your chance to bridge the gap between downtown and the once drug-riddled and dangerous Union Hill. Please help us maintain our momentum. We have the potential of any major urban neighborhood in the country. Please! Here comes more faux luxury condos. Apparently, you can never have too many. Michael is that tax revenue supped to entice? That’s not going to do anything for the average Richmond community member, that’s going to be forced out of their neighborhood to make room for high rollers. Aside from that, Richmond loses its diverse and eccentric community, historic appeal and charm, not to mention there are tons of already built properties that need love and attention, but are becoming more and more unaffordable for the average hardworking individual. And don’t get me started on the incense in property taxes that are on the rise. Just go see what original locals of places like Austin & Nashville are feeling and going through. I’ve lived it already, which is why I chose to move to a unique and beautiful place like Richmond. (The last cow pasture of my childhood city was sold and turned into a Walmart.) I was just naive and not realizing investors hadn’t yet taken over Richmond. Michael is that tax revenue supposed to entice? That’s not going to do anything for the average Richmond community member, that’s going to be forced out of their neighborhood to make room for high rollers. Aside from that, Richmond loses its diverse and eccentric community, historic appeal and charm, not to mention there are tons of already built properties that need love and attention, but are becoming more and more unaffordable for the average hardworking individual. And don’t get me started on the incense in property taxes that are on the rise. Just go see what original locals of places like Austin & Nashville are feeling and going through. I’ve lived it already, which is why I chose to move to a unique and beautiful place like Richmond. (The last cow pasture of my childhood city was sold and turned into a Walmart.) I was just naive and not realizing investors hadn’t yet taken over Richmond. And where will an extra 200 units park? 2 csrs per unit is 400 cars! Fingers crossed for row houses! No! No! No! No! No! There is nothing good that can possibly come of this unless I there’s someone out there with 2 mill that wants to drop it on a nature preserve or something. So sad for our tiny little neighborhood! Can’t we just keep the trees?? They had sign out there for weeks for people to call. Sign is gone now I’m sure not too many people called. The parking is crazy and is going to get worst when they build those apartments. I get where you’re coming from but have you been to the schools in this district? I can tell you first hand that they can use some of that property tax money. Mindie absolutely and I completely agree, but ultimately and sadly, we don’t invest in people or areas until they have $$, the schools then fix themselves once the low income residents are pushed out, forcing current students to other school areas and districts still in need of help, because we are making way for higher income families. I’m for progression and the community has been building and doing a nice job. But lately, investors not from the community are coming in to just make money, not nurture and build community. My foresight comes from where I grew up, and what I have already lived, hopefully I’m completely wrong about this and the areas and city will stay diverse, eccentric, and community members will be able to elevate together, not just pushed aside and pushed out. I don’t know about everyone else, but I don’t want to live in mini NOVA or Short Pump. Turn it into a park!! It’s a double edge sword isn’t it? What type of development do you think would work on this 3.6 acre $2.1m lot that would maintain the things you listed? I mean, yeah, there isn’t going to be an immediate and visible impact on the average citizen, but what does that? It certainly helps long term though. I’ve seen my property taxes rise the past few years, but in the end it’s additional funds for the city. What type of development do you think would work on this 3.6 acre $2.1m lot that would maintain the things you listed? I mean, yeah, there isn’t going to be an immediate and visible impact on the average citizen from the additional revenue, but what does that? It certainly helps long term though. I’ve seen my property taxes rise the past few years, but in the end it’s additional funds for the city. Michael Grabow In my perfect world? Call my crazy, but absolutely nothing. Maybe a preserve. As I mentioned, where I grew up the last patch of grass was sold to Walmart. By the time I left, I couldn’t breath from fumes it was so congested with pollution, people, buildings, and cars. There is already plenty of development here that can be improved upon rather than knocking down trees in exchange for new buildings that are going up overnight that are not quality made. Yet marketed as luxury. We have plenty of that luxury in Short Pump, yet now it’s slowly creeping in to push out people who have lived in these areas for decades, areas nobody gave a damn about. Such a slap in the face to these people, but it’s easy not to care when it doesn’t directly affect us. You say you are happy paying your increased taxes, and I completely understand why. I love this city and the local community, I want my efforts and my money going to help it grow, become better, while at the same time helping sustain my community. But at what point are you so completely squeezed, that you yourself can’t afford a city you have helped sustain during lower economical times? The new city they are creating and pushing for, isn’t for most of the people that have been here, it’s for the new era of the D.C./NOVA type. Either the D.C. companies moving here to keep their employees on D.C. salaries, or once the fast track rail arrives from here to D.C., making a way for more people from NOVA to move here and commute. I’m sure this all sounds a bit far fetched, but really it’s happening. Absolutely nothing I can do about it, other than discuss with the community. When people say Richmond is a tale of two cities, they aren’t exaggerating. Michael Grabow In my perfect world? Call me crazy, but absolutely nothing. Maybe a preserve. As I mentioned, where I grew up the last patch of grass was sold to Walmart. By the time I left, I couldn’t breath from fumes it was so congested with pollution, people, buildings, and cars. There is already plenty of development here that can be improved upon rather than knocking down trees in exchange for new buildings that are going up overnight that are not quality made. Yet marketed as luxury. We have plenty of that luxury in Short Pump, yet now it’s slowly creeping in to push out people who have lived in these areas for decades, areas nobody gave a damn about. Such a slap in the face to these people, but it’s easy not to care when it doesn’t directly affect us. You say you are happy paying your increased taxes, and I completely understand why. I love this city and the local community, I want my efforts and my money going to help it grow, become better, while at the same time helping sustain my community. But at what point are you so completely squeezed, that you yourself can’t afford a city you have helped sustain during lower economical times? The new city they are creating and pushing for, isn’t for most of the people that have been here, it’s for the new era of the D.C./NOVA type. Either the D.C. companies moving here to keep their employees on D.C. salaries, or once the fast track rail arrives from here to D.C., making a way for more people from NOVA to move here and commute. I’m sure this all sounds a bit far fetched, but really it’s happening. Absolutely nothing I can do about it, other than discuss with the community. When people say Richmond is a tale of two cities, they aren’t exaggerating. What the heck else do you guys think is going to go there? The lot is next to downtown. We have plenty of parks. Medical students need somewhere to live. This development is crucial to the success of what the city is developing downtown- like the 17th St. Farmer’s Market. It’s prime urban property. Richmond is rising to a new level. This development isn’t going to make a difference one way or another. Just let it go. Like the article says, it’s one of the last remaining tracts of land in the city available for development. I mean, if you can see the lights of MCV from your backyard- you live in a freaking city! Conveniently located near the liquor store. I have very fond memories about that hill, we used to slide down the hill towards Venable using cardboard boxes we got from Acme Grocery back in the day. Snow on the ground during winter and pine needles on the ground during summer… didn’t matter. Often on CHPN, people want to criticize the plans of property owners and developers who have already sunk money into their projects and have taken financial risks. This is different. People like Victoria with definite ideas of what is or is not appropriate can buy the property and follow their passion with it (within current zoning regulations). The person who buys this property will determine its fate within the zoning regulations. Maybe some folks here need to pool their money together to build their vision or to keep the property untouched. Maybe some folks here need to find a developer or investor who shares their passion to fund their vision. If you want to avoid “cheap condos” or whatnot on the land then buy the property or find a buyer who will do with the property what you think is best. Otherwise, I expect we will see apartments and condos because that is likely the use of the property that is most likely to generate maximum returns for the buyer. Might not be what I want. But I don’t have $2.1 million to impact that outcome. @BAF – While I see your point, you’re implying that wealth alone is the yardstick by which we should measure… Everything? Markets are an idea (free markets or otherwise) and properties rights are ideas that we use to organize our economy, sure, but you seem to think that they are all that matter. The neighbors in the surrounding community shouldn’t have the exclusive right to decide what gets built there, but would you agree that they should have some say? I mean, where do you draw the line – is building code or zoning too much “community oversight” for your tastes? I think we need to mobilize now before developers sink their teeth in. Any idea where to start? Who owns the property? Actually they have had their say. Their say comes through their vote and their voice in government. That government sets the zoning and the regulations for the property. If you want a different outcome on that property and do not want to buy it then this is how you do it–have City government change the zoning to a classification you think is appropriate BEFORE the property is sold. It’s land that’s worth nothing except to put VCU med students in. And that’s good for everyone. They will walk and spend money at local restaurants. Church Hill should embrace that demographic. No, I don’t think you understood my point. Zoning isn’t cast in stone. But that is where the fight is. The zoning determines what can go on the property. If you don’t want cheap condos, get the zoning changed to preclude them. Now that’s no small thing. If the zoning devalues the property, the owner may be due compensation or subject the city to legal proceedings. Also, if zoning devalues the property, the City takes a revenue hit too from reduced tax assessments. For everyone on CHPN who bemoans the condition of public services in the City you will only hamstring them further if you reduce the value of taxable property. But the time to make these changes is NOW. Before the property is sold. You know the potential uses. If you don’t like them, try to get zoning you prefer. Because if it IS sold, and the zoning isn’t changed, it is unlikely Council is going to pull the rug out from under the property owner who bought the property under the existing zoning. Assuming the zoning does NOT change, then the zoning dictates what is and is not allowable. Provided the property owner wants to develop within the framework of the existing zoning, they can do so by right. They don’t need the neighbors’ permission. If you want to control the development of a property you get four theoretical choices. First, you can buy the property and develop it within your vision assuming your vision complies with existing zoning. Second, you can buy the property and, if your vision is not appropriate for the existing zoning, you can request a variance (which WOULD subject you to neighborhood input). Third, you can NOT buy the property and hope the new owner will propose something that will require a variance thereby opening a window for neighbors to way in. Fourth, you can petition the City to change the existing zoning on the property even though you don’t own it. Choice #4 is the long shot. The democratic process took place when you voted for the people who enacted the zoning. Your redress is with the people who control the zoning. That’s the democratic process. It has nothing to do with how property is used, assuming the use is by right. You don’t get a say or a vote in what I do with my property provided I am acting within the code. You just don’t. The use of my property is subject to your view only if I choose to use it in a way that goes outside the rules that we all have to play by. Private property is not a community asset subject to community whim, provided no one seeks a change to the rules governing the property. Bottom line, Lee, is if the zoning permits cheap condos by right and you don’t want cheap condos, you better come up with $2.1 million or you better hope City Government is willing to risk a lawsuit by rezoning the property by fiat to meet your vision. As for taking it for parkland, the City is likely to be rather reticent in its current financial condition to spend the money on acquisition and then the ongoing maintenance while also losing the tax revenue generated currently and that would be generated with development. Maybe they would buy it, but I wouldn’t hold my breath. I’m pretty sure building code and zoning both allow for faux expensive condos. @28, what kind of community oversight would you prefer? @BAF – I think you miss my point. I don’t have a dog in this fight (yet, anyway, there isn’t even anything proposed for the site!). My point is that you seem to be complaining about other community members complaining, and then telling them that they should participate in one or more political processes, but also telling them that they shouldn’t – or that they should participated previously and now it’s too late. Perhaps you’re suggesting that they should speak with the district Councilwoman or members of the Planning Commission directly, but you also seem to be saying that community members shouldn’t have an opinion about what happens with this parcel because at the end of the day it’s already zoned and it’s someone else’s property. As I said originally, I’m curious as to where you draw the line with regards to how much input the community should have on new development and how that input should be gathered/gauged/considered/etc. I’d argue that concerned community members/NIMBY’s/Whatever you want to call them factually do have quite a bit more influence or sway than just demanding zoning and code enforcement – but that’s a factual statement, not a value judgment). Also, aren’t publicly initiated zoning changes relatively infrequent to begin with? Does Richmond do ten year reviews or something similar as part of it’s long term planning process? And am I wrong to say that zoning isn’t exactly a direct democratic process? Isn’t the passage of zoning ordinances usually a public input/feedback process, rather than a matter of direct voting? I ask because it seems odd to tell people that are unhappy with the idea of this parcel being developed (or, developed a certain way) that they should have previously voted for different council members. Especially since both the Planning Commission and the Board of Zoning appeals are mostly comprised of appointees. Maybe I’m not understanding you, though. As for zoning specifically- I worded that poorly, my apologies. My point was that if someone buys the land and does not develop it promptly, the zoning could very well be changed. I’m familiar with much of what you said in your previous post and I imagine, as you suggested, that if an ordinance to change the zoning were proposed suddenly/immediately after the land was purchased (or even now that it has been offered for sale), that the property owner might try to litigate and claim that the change constituted a taking. But that doesn’t mean that concerned neighbors can’t speak with each other, the planning commission, city council members, or directly to developers to try to change the zoning or otherwise influence the development outcome. I think I see your point about people stepping in too late in the process to try to influence outcomes, but that seems like it could just as readily be viewed as an undesirable bug as it could be considered a desired feature. Anyway, it also appears that any substantial development on this particular site would have to include mixed use components (at least, on the portion zoned B-5) and would likely require the city to approve a plan of development to assure that whatever gets built would be appropriate for the area. Seems like an area that “concerned community members” could exploit to influence development outcomes (Admittedly I’m not as familiar with the Plan of Development process, if anyone wants to chime in). Also – please realize this is not meant to be some sort of attack. I find this all sort of dryly interesting, but like I said earlier I don’t have a particular outcome I’m looking for (The notion of turning it into a park seems a little silly, for example. I mentioned it only as a hypothetical). I do worry that whatever ultimately gets proposed for the site will probably be utter crap architecturally, but that’s not even a consideration yet. Again, I’m curious what you think is a reasonable process for and/or amount of community input regarding planning and development, as you seem to be weighing in exclusively on the side of individual property rights and assuming that community members don’t or shouldn’t have any further say in the matter (in contrast to several other folks who have commented/posted that seem to have an unrealistic and single minded focus on limiting new development or preserving the trees or what-have-you). Medium-rise housing, 7% public housing, with a large commercial anchor tenant that needs blue and white collar workers. If i were rich enough I would buy this, clear all the land and erect a 100ft tall statue of David Hasselhoff waving a confederate flag while riding a unicorn.